Woven from coppiced hazel to a traditional pattern, this beautifully crafted eco-friendly wigwam is sure to be a lovely addition to your garden as an ideal shady spot, providing hours of endless fun for kids. Hand woven from young and therefore thin hazel branches, the rustic looking wigwam is robust, hard-wearing, and is comprised of 4 panels, all of which are easy to put up and to take down. 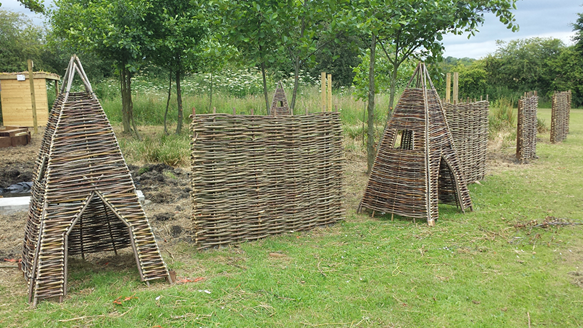 The hazel wigwam is coppiced, meaning the branches are cut only from new growth. The purpose is two-fold: to ensure that the branches or 'wands' are flexible and of reasonably uniform thickness. Bring a part of the countryside to your very own garden with this hazel wigwam, which will be a perfect playhouse for any young adventurer. This beautiful decorative piece can be expected to provide a good few years of service and will age gracefully while still maintaining sturdiness. This Children's Woven Hazel Wigwam is a versatile and Eco-friendly alternative that will blend seamlessly into your garden. This play safe rubber mulch is impact absorbent and non-toxic, making it perfect for areas where children or pets are playing. Easy to install, this durable mulch deters the growth of mould, fungi and weeds and can last all year round. 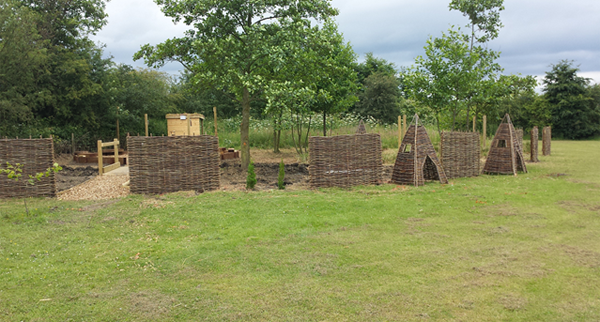 Thanks to Dig It Projects for these great photos of these twigwams and our Hazel Hurdles installed in a school garden. "Awesome addition to my garden and for the grandchildren to play in. Very sturdy and looks great." "Excellent product really well made"
"Love it, looks fantastic. Gives the children a den that looks natural in the garden." "The Twigwam is beautifully made and easy to put up using plastic ties supplied. It looks good and blends nicely in the garden. In the clear instructions that come with it is also suggested that you put clear varnish on it and to possibly store inside during winter months to preserve life. A lovely natural product. Primrose also appear to do the best price"
"I was a bit disconcerted when the twigwam arrived and needed assembly but the instructions were clear and assembly was VERY easy - just a shame that a natural product had to be held together with plastic ties." "Product as expected - actually constructed better than expected. The cable ties could have done with being just a little longer to make them easier to fix. An optional door guard might be useful to keep cats or foxes out of the twigwam when not in use. I made one from some hazel canes." "Lovely style, size good for two children. Easy to fix together however, you need longer ties, luckily I had some. I've put a couple more on for extra strength. Am a childminder so will get lots of use."